The BBC Back In Time series is having another outing, this time as Back In Time For Tea – that’s tea in the sense of evening meal from the days of breakfast, dinner and tea. If your evening meal was called dinner and your mid-day meal was lunch, you were either posh or a Southerner. The new series does take place in working class Bradford after all. Episode 3, set in the nineteen-sixties, saw the Ellis children having to get their own tea: Fray Bentos Steak and Kidney Pie, Angel Delight and Mr. Kipling fruit cake. Oh yes, steak and kidney pie in a tin! I remember it well! It’s what we ate in the shared house. Those steak and kidney pies were delicious – succulent pieces of steak and kidney in juicy gravy. The pudding version was good too with suet instead of puff pastry. You can still get them, although internet commentators tend to imply they might not be as good as they once were. Is anything? 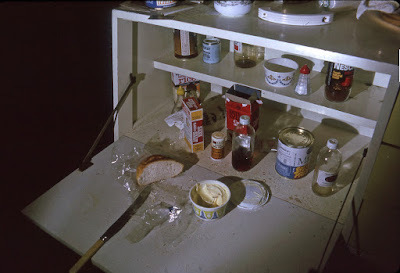 For the first time, the arrival of ready meals in the late nineteen-sixties made it possible for single lads living in flats, bed-sits and house shares to eat well without the needless mental and physical exertion of planning, shopping and cooking. Deciphering a recipe, patronising butchers and grocers, and assembling a steak and kidney pie from scratch would have been well beyond the ingenuity of spoiled brats brought up by their mothers to expect everything done for them, but wielding a tin opener and turning on an oven was just about within their capabilities. This was especially true of the five social misfits, connected through schools and workplaces, who in 1970 moved into a strange back-to-front house off Monk Bridge Road, with its rear to the road and front to a narrow path beside Meanwood Beck. My previous year in Leeds had been spent in Monday-to-Thursday lodgings where meals were provided. It was good home-cooking to keep hunger at bay but the snooty husband of the elderly couple I lodged with charged in guineas rather than pounds: five guineas a week, that’s five pounds five shillings, £5.25 in new money, equivalent to around £75 now in terms of price inflation, and £150 in terms of earnings inflation. Perhaps that sounds reasonable compared with housing costs today, but it was nearly all I earned as a trainee accountant. My contribution to the shared house rent was less than half as much. At first we ate together, taking turns to serve unimaginatively greasy concoctions of sausage or fried eggs, with chips and baked beans. One lad’s weekly pièce de résistance was spaghetti Bolognese with so much liquid it would slop over the edge of your plate when anyone knocked the table – “as if we haven’t enough on our plates already,” someone said. The local fish and chip shop was a regular beneficiary of our largesse too. But convenience foods were just beginning to appear and our diet quickly changed. Why go to all that inconvenience of peeling, boiling and mashing potatoes when you could get Cadbury’s Smash? It wasn’t too bad if you put plenty of butter in. Instant mashed potato with a Fray Bentos pie and a tin of peas or carrots really filled you up. 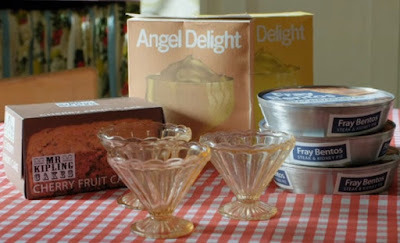 Finish with strawberry or banana Angel Delight (a powder mixed with milk to make an instant mousse-like desert) and it was heaven. You were living like a king. Individuals came and went and the sharing arrangement moved to a new address off Brudenell Road in the Hyde Park area. Mostly, we now ate individually at different times. I still had an unhealthy reliance on the “Up-Steps Fish Shop”, but as there were as yet no Chinese or Indian takeaways, pizza or kebab shops nearby, fish and chips was the only bought in meal. For other days, Vesta dehydrated packet meals were now available: food for bachelors from Batchelors. 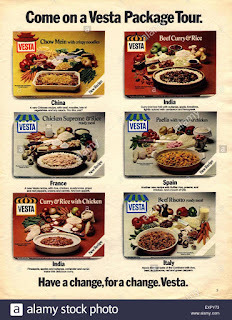 “Come on a Vesta Package Tour” read the advert, to India for beef curry (“not too hot”), Italy for beef risotto (“the real taste of the Continent”) or China for chow mein with crispy noodles (“You like, yes?” – would they dare say that now, or wish you “bon appétit” with the chicken supreme from France, or claim that the Spanish paella had “a touch of Olé”). The noodles looked like translucent strips of plastic until tipped into hot oil upon which, spitting and sizzling, they crisped up like expanding polystyrene into gnarled and crunchy yellow whorls. Except that there always seemed to be one or two that didn’t work, and stayed hard and sticky enough to pull your fillings out. The curry looked like a packet of something you might collect from a crematorium until you added boiling water and it reconstituted itself into peculiarly light and watery chunks that were supposed to be beef. The risotto seemed best, especially when you fried the rice in butter (with extra Uncle Ben’s rice to bulk it up) and then added the meat and vegetable powder with a bottle of Newcastle Brown instead of water. The only time I’d had rice at home was as rice pudding, and other than spaghetti, it was my first experience of exotic food. It was mouthwatering if you overlooked all the monosodium glutamate, although you usually had to fire up the toaster before bed time, even when you had eaten a ‘serves two’ sized packet. I never prepared anything from scratch. Vegetables, spaghetti hoops, even potatoes, came out of tins. Frozen foods such as fish fingers, beef burgers or the delicious boil-in-the-bag cod in butter sauce were all bought on the day as we had no fridge. Everything was heated by hob, grill or oven, as microwaves would not be common for another decade. I bought a ‘cooking for one’ cookbook which made out that everything was so simple, no one need end up dipping grilled fish fingers into a jar of tartar sauce, which was the only recipe I took from the book, although they were better with piccalilli. And much to the bewilderment of my family, I retain a weakness for tinned oranges with Carnation evaporated milk. Nearly all of these convenience foods remain available, but as a vegetarian convert I wouldn’t eat them now. 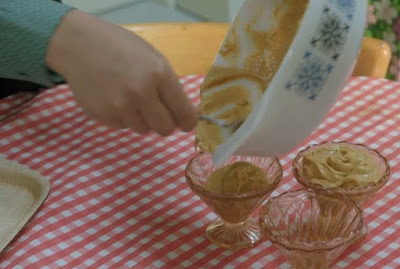 However, we did try banana Angel Delight with our tea the other night. Surprisingly, it was just as good as I remember. Inclusion of the clips from the BBC Back In Time For Tea programme and the Alamy Vesta image are believed to be fair use. The stills are clipped from single frames and linked to the programme web site. The Alamy image is linked to its source. The Vesta image is also available at The Advertising Archives. Hi Nita. I'm sure you're not missing anything at all. Your blog shows you could produce all these dishes yourself from raw ingredients, and much better (except maybe for the Angel Delight). Ohmygoodness! You painted such a vivid picture, I'm feeling a bit queasy! I grew up cooking so I've not had much experience with packaged foods. I'm going to look up this series - bound to love it! Queasy is probably an apt reaction. The related BBC series would also be interesting to a foody - Back In Time For Dinner was the first: social history with a food emphasis. I also enjoyed Back In Time For The Weekend. I'm not sure whether you can still view them on the BBC iplayer. I believe the next series is to be called Back In Time For School.